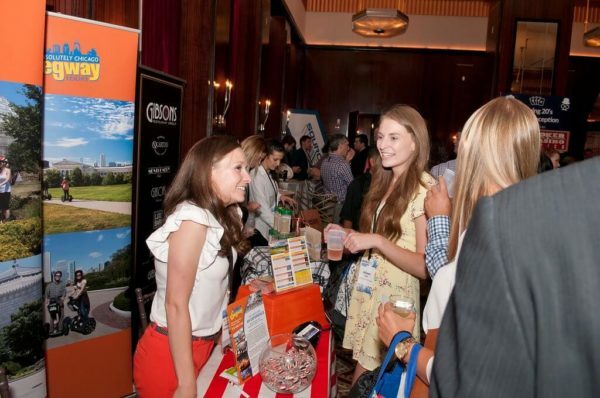 The brightest minds in the Chicago hospitality industry united Wednesday, Aug. 16, for an evening of festive networking, hearty laughter and exquisite food, thanks to Hospitality Fest 2017. 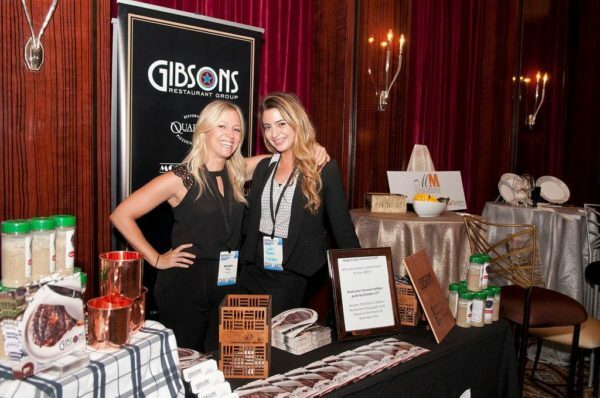 The event, hosted by Here’s Chicago, the city’s most trusted source for meeting and event planners, was held at the Montgomery Club, 500 W. Superior St. Food and beverages were provided by Gibson’s Restaurant Group. 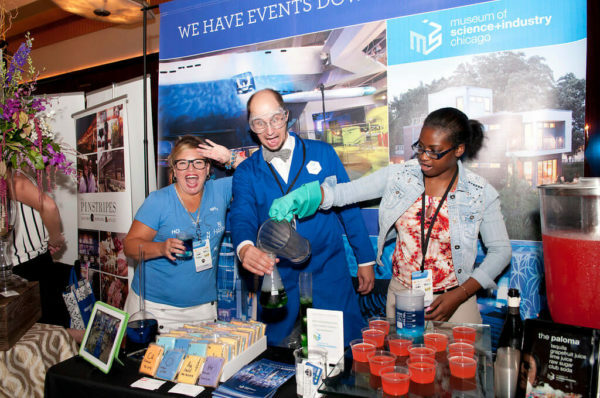 With 570 registrations, Hospitality Fest was awash with event planners, hospitality professionals and some of Chicago’s top venues exchanging ideas and enjoying entertainment, samplings and raffle giveaways. 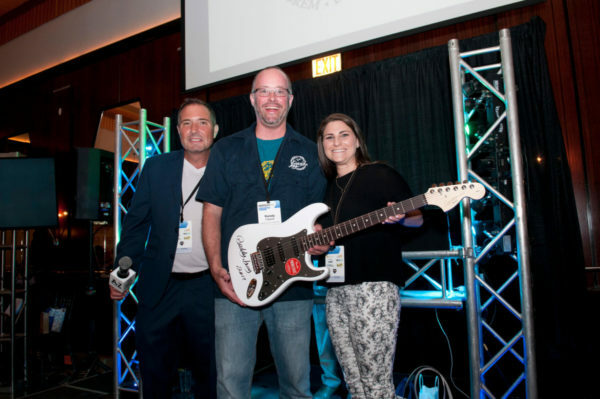 Among the night’s raffle prizes were a gramophone donated by Ravinia Festival, a baseball and photo signed by former Chicago White Sox All-Star Paul Konerko and a guitar autographed by Blues legend Buddy Guy. Attendees also received gift bags that included the Here’s Chicago and Premier Travel Media 2017 Chicago Holiday Party Planning Guide, a magazine containing party planning and hosting tips from some of the finest entertainment experts in the Chicagoland area. Many participants frequented the Here’s Chicago 2016 Hospitality Fest and found the experience so valuable, they returned for this year’s festivities. Like most exhibitors, Hajduk’s space featured a distinctive flare, as an autographed Buddy Guy guitar (that was later donated for the raffle) sat upright on his table, drawing admiring eyes. Stan Hansen, senior marketing specialist for the Museum of Science and Industry, also joined in on the fun as he wore a fashionable dark blue lab coat while he and his associates dispersed information about the museum along with cookies decorated to resemble entries from the Periodic Table of the Elements. Many vendors opted to serve snacks at their table, be it cookies, candy or, in the case of Joy District, a New American restaurant and cocktail bar, attendees were encouraged to make their own s’mores treats. The Hard Rock Café also opted to give away chocolates, with their offerings shaped like delicious guitars. 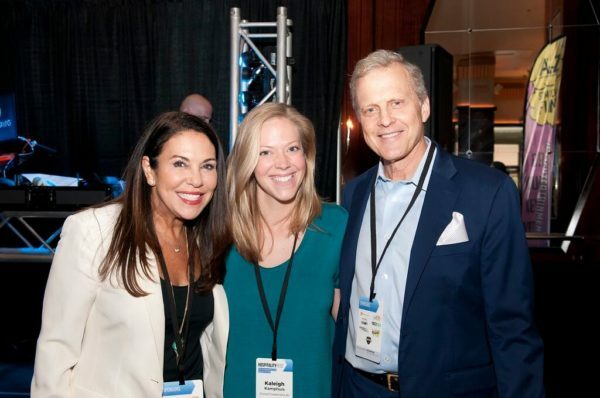 Venerable Chicago television and radio hosts Bob Sirott and Marianne Murciano were also on hand, providing their brand of cagey humor while mingling with patrons. One such attendee who harvested the fruits of the 2016 Hospitality Fest and returned for this year’s event is Jim Goodrich, owner of With A Voice Like This. 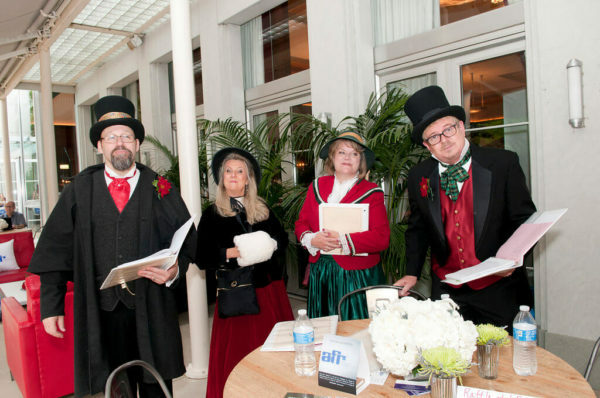 Goodrich serenaded the crowd with Christmas Carols while dressed in a Charles Dickens-styled outfit and afterward, sang the praises of Hospitality Fest. 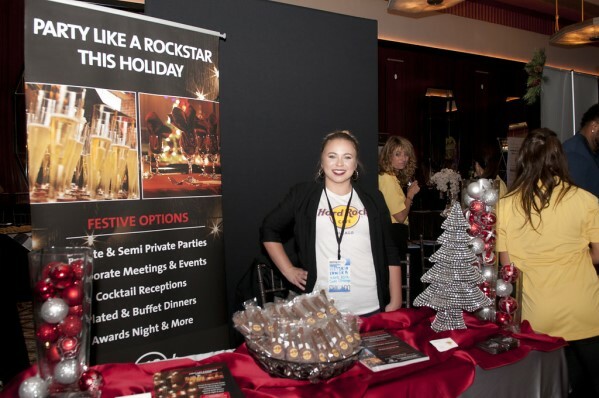 “This is the perfect time for venues to showcase their holiday party offerings” said Jim Grillo, CMP President of Hereschicago.com and founder of Hospitality Fest. If you attended Hospitality Fest 2017, the founder of the event, Jim Grillo, CMP would love to hear your comments & feedback about the event. You can drop him an email at jim@hereschicago.com.